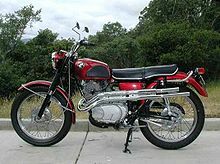 The Honda CL77 was a 4-stroke 305cc motorcycle built by Honda between 1965 and 1968. The CL designation indicated this model to be the "Scrambler" version which implied some off-road capability prior to actual dirt-bikes gaining popularity. The CL series of bikes were actually street bikes with a higher rear fender, a braced handlebar, and a high-mount exhaust. 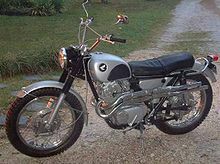 The CL77 Scrambler 305 was a close relative of the Honda C77 Dream and the Honda CB77 Super Hawk of the 1960s, and was based upon the CL72 scrambler (250cc) of 1962-65. Scramblers, designated CL by Honda, differed from the sport bikes (designated CB) to allow for some off-road riding. The CL77 differed from the CB77 Super Hawk in a number of ways. To increase ground clearance, it had the up-swept exhaust pipes running along the bike's left side. It eliminated the electric starter. It had a small-capacity fuel tank, The fuel tank had a rubber knee pad, fork boots, 19-inch front& rear wheels, coarser-tread tires (called universals), a taller handlebar, and abbreviated fenders. In 1966, Honda gave the CL77 much better braking (using the brakes from the CB450), as the smaller drums (carried over from the CL72) had proven woefully inadequate. Other changes from the CL72 included steel fenders in place of the Cl72'a aluminum units, and in 1966, revised front forks to go along with the better brakes. The 305 cc overhead cam engine had a redline of 9000 rpm and contrasted sharply from the low-revving European and American bikes of the day. Running straight pipes, CL77s feature a loud and very distinct sound. Many of these motorcycles often feature snuff-or-nots (commonly misspoken as "snuffer nuts"), which feature a flat piece of metal used to cover the tips of the exhaust pipes to quiet or increase the sound of the motor at any time during operation. In 1968 Larry Berquist and Gary Griffen won the second official Baja 1000 race on a CL350 the year before he had been leading the race on a CL77 when it broke down outside of Rancho Santa Inez due to a rectifier failure. This page was last edited on 23 November 2010, at 04:54.